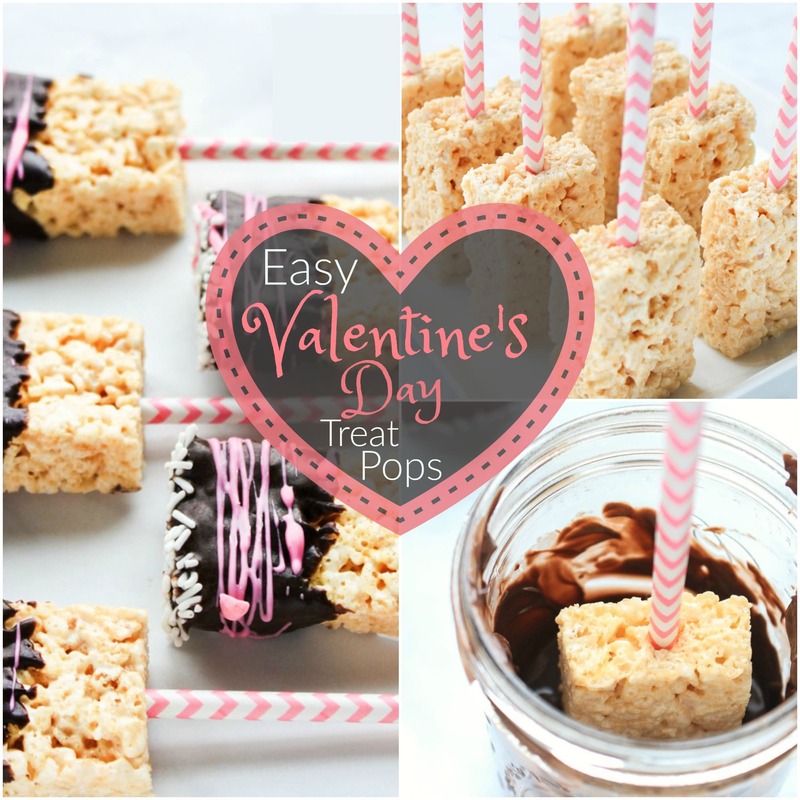 Rice Krispie Valentine’s Day Pops are Super Simple! Valentine’s Day is a favorite around our house! We make each other cards and give simple gifts to let everyone know how special and loved they are. 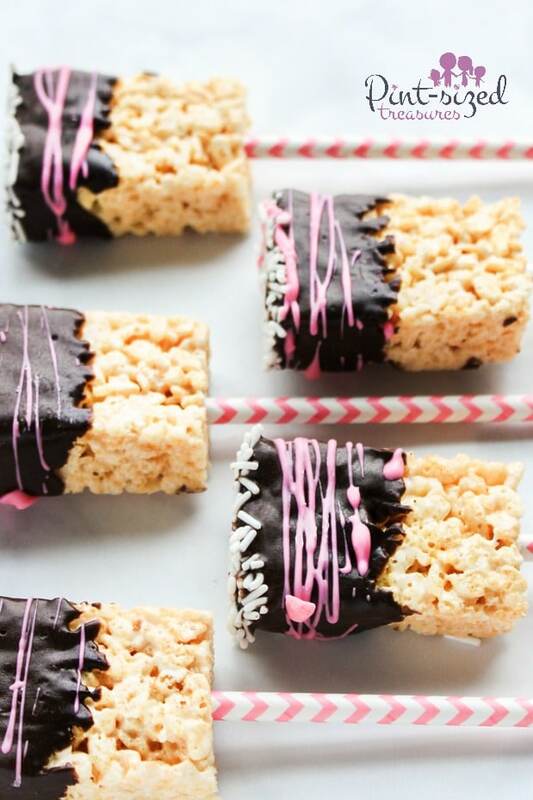 Maybe you remember the SUPER VIRAL heart-shaped rice krispie treats we shared a few years ago? If you don’t you need to head over there right now and see those cuties! They look just like conversation hearts. How cute is that?! Why does this busy mom love these treats? Because they’re a cinch to make! Plus I just happen to be a die hard rice krispie treat fan. If there was a rice krispie fan club I would be a card-holding member! And since I’m a die hard fan I must admit I’m a tiny bit of a rice krispie treat snob. It means my Rice Krispie treats better have enough marshmallows and buttery goodness to make them gloriously sticky! Don’t give me a dry rice kirstie treat! I just may gag! 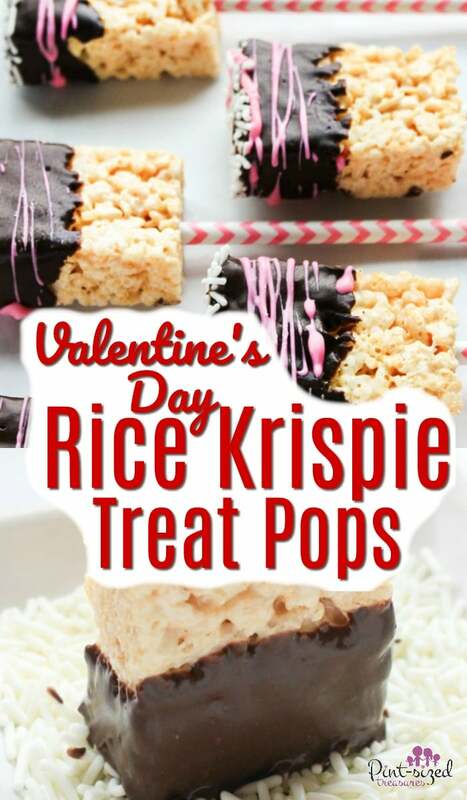 And as a Rice Krispie treat snob, I think you’ll love this other variation of Valentine’s Day Rice Krispie treats…they’re cut-out hearts! And let me let you in on a little baker’s no-fail secret. I am not good at making cake ball pops. My cake ball pop attempts always end up being frustrating, messy and unsuccessful. 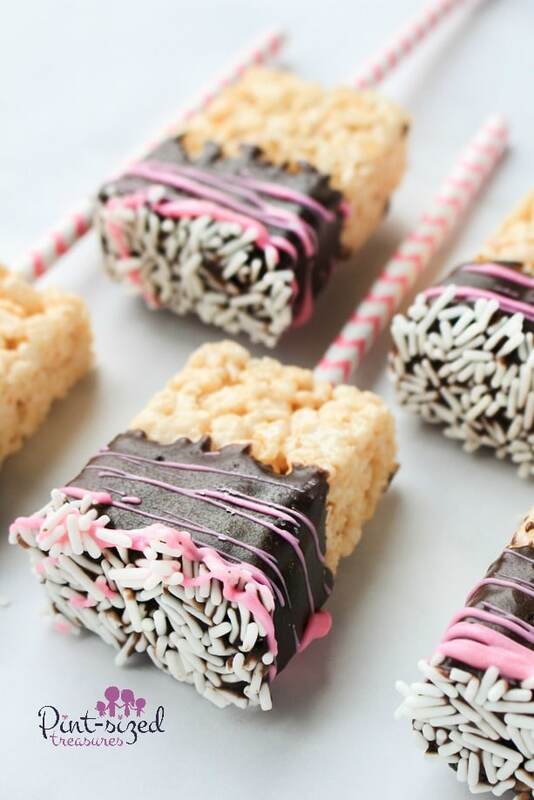 That’s why this moms holds onto rice krispie treat pops. I can succeed in making these and at the end of the day and my kids think I’m super-mom. That will bring a smile to any mom’s face! 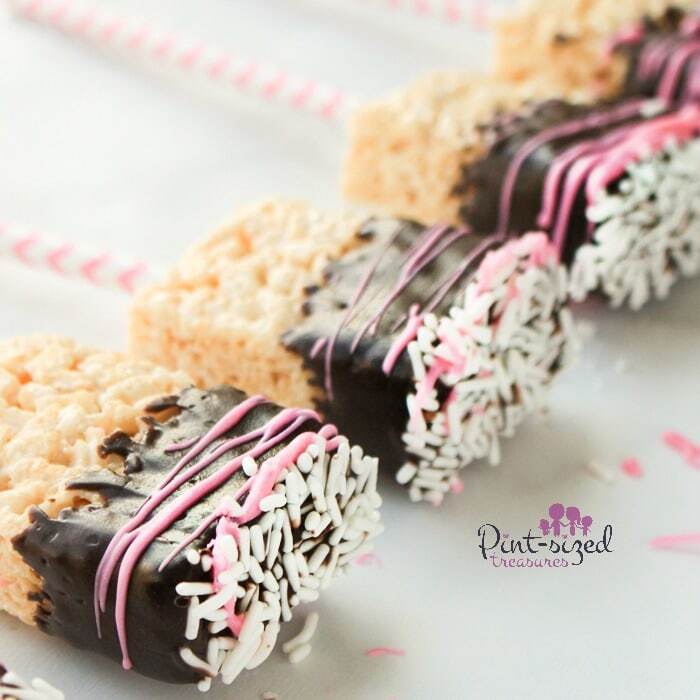 Oh, and they loved this strawberry-filled rice krispie treat recipe too! 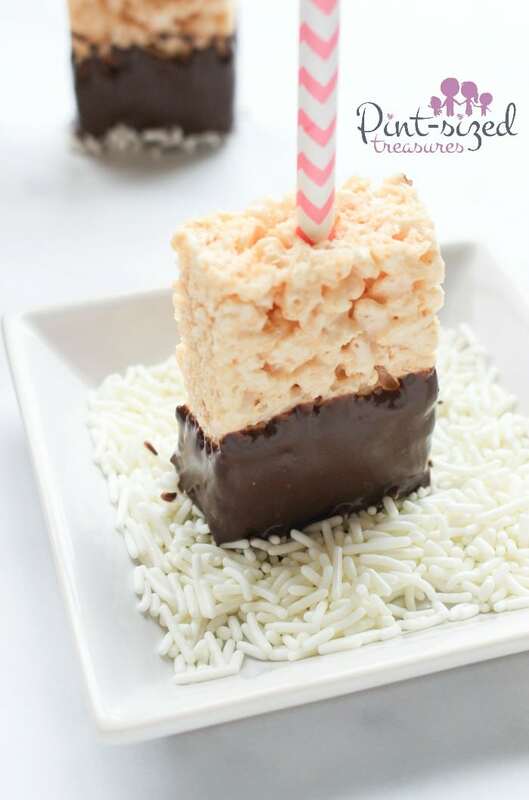 It tastes like one of my fave Little Debbie treats all wrapped into a rice krispie treat. Seriously — you should try it! Did I tell you my kids LOVE being in the kitchen with me? We’re always cooking and baking together. We have a six burner stove and there are always at least people cooking on the stove at each meal time. 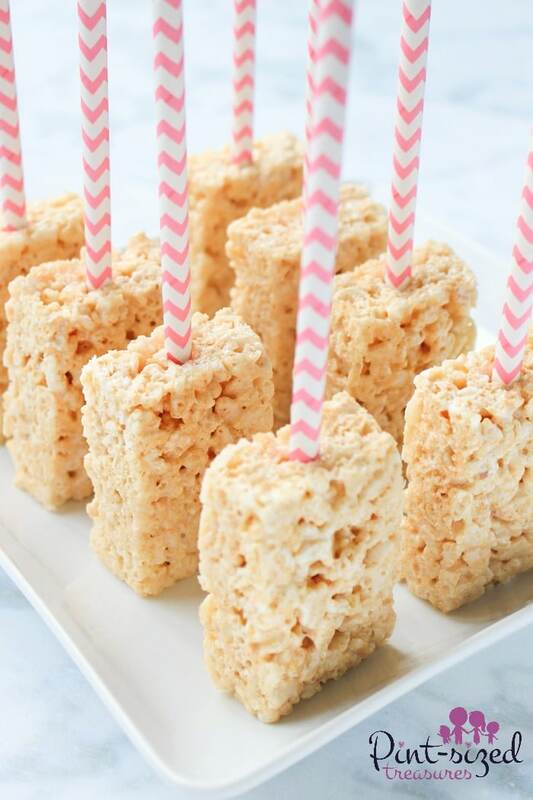 When we make rice krispie treat pops as an extra snack or dessert, there are at least two people hovering over the melted butter and marshmallowy mix! My husband is not a sweet treat lovin’ kind of guy. In fact, that’s why I rarely made treats or goodies the first 10 years of our marriage! He thought (and still does to some extent) that sweets and goodies were a waste of money, time and calories. But that was before rice krispie treats. He’ll always reach and grab one of these beauties! And he’ll thank me for making such a cute treat for him and the kids. Ready to whip up a simple batch yourself? Recipe follows below! 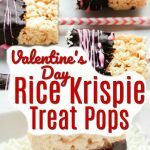 Rice Krispie treat pops are perfect for Valentine's Day! They're dipped in chocolate and covered in sprinkles! Line a 9x9 pan with foil and spray lightly with cooking spray, set aside. Melt butter in a large pot over low heat. Once butter in melted add in 8 cups mini marshmallows, stirring constantly. Once the marshmallows are just melted remove from heat and stir in your cereal and salt until just coated in marshmallow mixture. Now stir in the remaining 2 cups of mini marshmallows. This is what makes these treats oozy-gooey! Pour mixture into prepared pan and press evenly. Allow to cool completely before cutting into rectangular pops. Allow treats to completely cool before dipping and decorating. 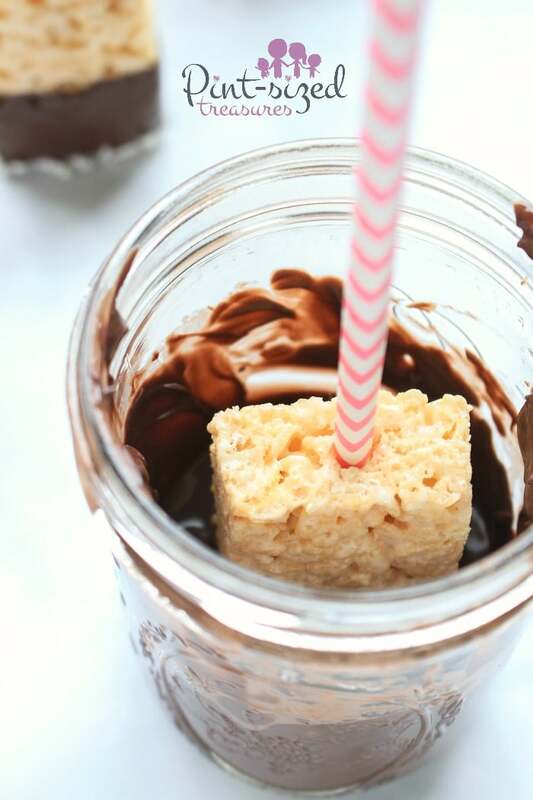 Once treats are completely cooled, hold Rice Krispie Treat in palm of hand and firmly press straw about 3/4 of the way in. In a microwave-safe cup, heat dark cocoa candy melts with half of vegetable oil. Heat in 30 second increments, stirring each time, until fully melted, or about 90 seconds. Dip half of the pop into the chocolate, let excess drip off or gently wipe off excess on the inside rim of the cup. Firmly press bottom of pop into sprinkles. Allow to dry on a flat surface, sprinkle side down, until chocolate hardens (about 20 minutes). Repeat the candy melting process for the pink candy melts, using remaining vegetable oil. Allow to cool slightly, about five minutes. Use a fork to quickly, but carefully, drizzle over the chocolate-covered portion of the pops. Allow to harden, then repeat on other side if desired. Serve immediately or store in refrigerator for up to three days. Best if served same day for ooey gooey treats!